My father-in-law in fighting lymphoma. Since he likes my cards, I try to make him cards every so often to let him know we're thinking of him & praying for him. This past Monday (April 20) was his first chemo treatment. I can only imagine the thoughts & emotions that he and my mother-in-law are feeling right now. I mailed this simple card to let them know they were especially in my prayers on that day. Supplies: Paper - Bazzill & Scribble Scrabble (Betty's Collection), Ink - Colorbox Fluid Chalk (Maroon), Stamp - Michael's (Just for You), Brads & Flower are from my stash. I used the Fluid Chalk ink to add color to the flower. I have had these card blanks from DCWV for a very long time. I love the scalloped edge but have never been very happy with the cards I've attempted to make with them. The other night I was looking thru sketches on Triple the Scraps (TTS) for ideas when I came across Sketch #10. It reminded me of these card blanks and after a little adapting, I'm pleased with the outcome. One thing I love about the sketches on TTS is that they are so easy to adapt to what you want to do. Here are two cards I'm made using these card blanks and Sketch #10. On both of them, I used my crop-o-dile to punch a hole in each scallop for a lace effect. I think this is my favorite baby card I've made to date. I was able to use lots of things from my stash too. That's always a bonus. Supplies: Scalloped edge card & Rubon stitches- DCWV, Papers & triangle shaped tag - Basic Gray (O Baby Girl), Flowers - Prima, Bling - Michael's, Bunny Sticker - SandyLion Precious Moments Girl collection, Baby sticker - ?? Last Sat., April 18, was a little known holiday called Husband Appreciation Day. My husband spoils me quite a bit so I took advantage of this holiday to let him know I notice the things he does and that they are greatly appreciated. Since he likes my cards, I made one for him to say "Thank You" for all he does for me. I used the Joy Fold card Georgina Hefferman illustrated in her tutorial on ScrapJazz. You can find the article here. I've used this design several times and still love it. Supplies: Papers - Bazzill, Scribble Scrabble (Betty's Collection) & Georgia Pacific, Ink - Colorbox Fluid Chalk (Maroon), Stampendous Clear Detail Embossing Powder, Stamp - Unity Stamp Co. (You Make My Heart Sing), Stickles (Christmas Red), Pens - Zig Ball Writer & SU Journaling Pen (Almost Cocoa), Brads - ?? I also recently found this adorable Three Bugs in a Rug paper at my LSS. I think it just looks like spring. It was perfect for a couple spring birthday cards and a card for a friend. Each of these also uses the Fiskar's Threading Water Punch for extra detail. Here are a couple cards I recently made using BG's Two Scoops and K-ology's Hannah papers. In this first one I used my Fiskar's Threading Water Punch to add a little lace detail to the plaid paper. It uses the April sketch from AC Bailey Designs. As a final crafted item to add to the Easter goodies I sent to Kendra's friends, I made the girls stationery sets. I followed the themes used with their jelly bean bottles. For everyone but Linsey I used the same papers. The design came from this article on Scrapjazz by Georgina Hefferman. I used medium weight sketch book paper from Mead for the stationery sheets. Aurora's dress is outlined with stickles and her belt, the white on her bodice & crown are also accented with them. Every princess needs her bling. I want to wish each of you a Happy Easter! I'm so thankful for the gift of salvation that Christ provides for us through His death on the cross, His burial and His resurrection. In all of the "fun" we all enjoy surrounding Easter, let's not forget the true meaning for this special day. He is risen! He is risen indeed! I enjoyed trying to tailor each bottle to the recipients' likes/interests. Emily loves Aurora (aka Sleeping Beauty). Julie likes "funky" colors & retro. Linsey likes purple. Kendra likes frogs. 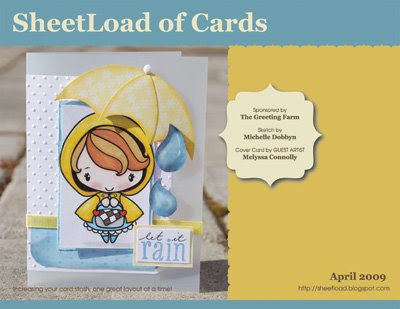 Have you seen the new April edition of SheetLoad of Cards? If not, be sure to stop by soon and check it out soon. Here's the link to the April Edition. See my post below to see the card I made from the April sketch. It's the 3rd card shown. I made a couple quick, little cards to enclose with small Easter gifts for Kendra's roommates. They all use Patter Cross' stamp Almighty God from the Unity Stamp Co. I love that stamp. I'm helping a friend at work with some things for her daughter's birthday party. I designed digital invitations, bookmarks, altered notebooks & goodie bags. Then we embellished them with Prima flowers, ink, glitter glue & bling. We also added some ribbon to the notebooks. The goal was something fun & funky. I think we accomplished it. Haleigh (the birthday girl) has seen the invitations and LOVED them. The rest is to be a surprise the night of her party. Danielle is giving away some amazing goodies on her blog, Life, One Layout at a Time. She's actually giving away three different prizes...one of which is a Bind-it-All. Go check out her blog here to see how to win.